Oracle For SQL Server Developers, Vol. 2 – Benjamin Day Consulting, Inc.
Here’s another post in my Oracle for SQL Server Developers series. Tip #7: What is SQL*Plus and how do I connect to Oracle with SQL*Plus? 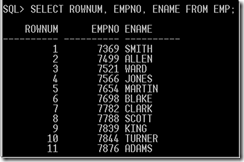 SQL*Plus is a command-line client for talking to Oracle. It’s similar to SQL Server’s sqlcmd.exe. It’s usually installed in $ORACLE_HOMEBINsqlplus.exe so on my machine with a default install that path ends up being C:appusernameproduct11.1.0client_1BIN. There are (at least) 3 ways to connect using SQL*Plus. Tip #8: What is the equivalent of the “sa” user in Oracle? In SQL Server, the “sa” username is the adminstrator for the database instance. The rough equivalent in Oracle is the SYS username. Tip #9: I’m getting an error when I try to connect to Oracle as an administrator. Tip #10: How to get around in SqlPlus. Yah. 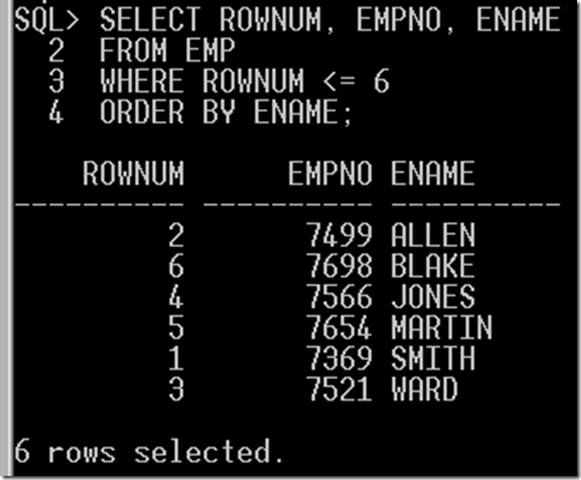 SqlPlus is old, clunky, and obtuse. Here are some ideas to get you going. To get a lifeline out of the technological stone-age, type ‘edit’ and your command buffer will show up and be editable in notepad.exe. (Yah…notepad’s not a hell of a lot better than command line but well, it’s Oracle. It’s supposed to be hard.) When you’re done editing your command buffer, save the file using the filename that SqlPlus assigned to you, and exit notepad. If you want to execute a query that is stored in a file, type in ‘@’ followed by the filename. For example, if you’ve got a query stored at c:myQuery.sql, type in “@c:myQuery.sql”. To exit SQLPlus, type ‘quit’ or ‘exit’. If you want to learn more about SQLPlus, type ‘help index’ for a list of help topics. For more information about a specific help topic type “help topic_name”. Tip #11: How do can I see what columns are in a table? Tip #12: How can I put row numbers in front of every record in my result set? 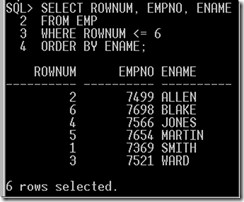 Tip #13: What’s the equivalent of “SELECT TOP” in Oracle? 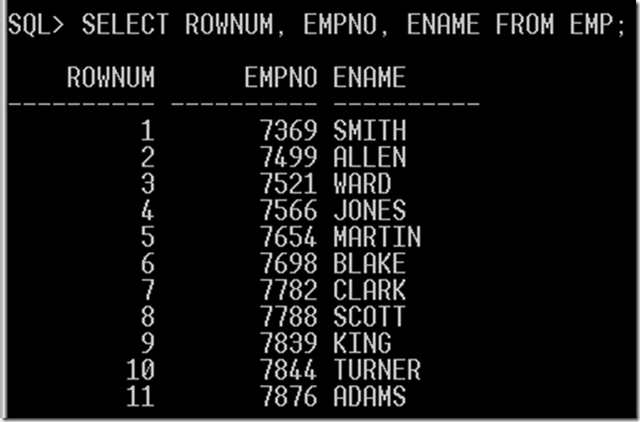 Tip #14: ROWNUM is a mess when I use an ORDER BY clause — OR — How can I do a TOP query and sort the results? The ROWNUM values are out of order. The SELECT in the parenthesis brings back the first 6 records and sorts them. Then the outer SELECT queries that result and adds the ROWNUM. Click here to read the next Oracle for SQL Server Developers post. One Response to "Oracle For SQL Server Developers, Vol. 2"